Split Lotus Notes Mailbox, Archive & Contacts by Year, Size, Folder, Date. The Split NSF tool supports Lotus Notes 9.0, 8.0, 8.5, 7, 6 & below Versions to reduce size of Lotus Notes Mailbox, Archive and Contacts. The NSF Splitter tool supports various Windows OS versions such as Windows 10, Windows 8.1, Windows 8, Windows 7, Windows Vista, Windows XP, etc. The tool split the Lotus Notes Mailbox, Archive NSF file and Address book (Names.NSF). If you need to reduce size of your Lotus Notes Mailbox Database, then divide it using SysTools NSF Split Software in 4 different ways: Split NSF File by Size, Split NSF File by Size, Split NSF File by Year & Split NSF File by Date. Note: The tool also support NSF files of Domino Server. If your NSF file is password protected, the software prompts for the password and successfully breaks your large NSF database. The tool also works on encrypted NSF files & splits them accordingly. If the size of the Lotus Notes database is too large & needs to be broken to, chunks of equal size then use this option. You can define the size range from 5 MB to 10 GB & the reduce Lotus Notes Mailbox size according to the defined size. Using this option, you can create multiple NSF files representing each folders of the database. Further, these folders can be divided according to the size. For instance: Inbox.nsf for Inbox folder, Outbox.nsf for Outbox folder is created separately & further you can maintain the size of each file by applying size filter. The software is intelligent enough to easily split your Lotus Notes database according to year & create a separate NSF file for each year. For example, if you selected year from 2010-2013 then software creates three individual NSF files representing each respective year. The software is compatible with NSF file of any Lotus Notes version, i.e. 9.0, 8.0, 8.5, 7, 6 & below. The tool successfully Split NSF files with the listed versions of Lotus Notes without any failure encountered in process. You can compare your NSF file after splitting it, in the "Compare Report". You can click on Compare NSF button and generate CSV file to know the folder path, size, difference before and after splitting the NSF file. Can you briefly describe the overall features of this tool? Is there any way to split a large archive of Lotus Notes? You can create multiple NSF files from your heavy Lotus Notes Database archive by using Split NSF File Tool. If you need the file to be split Lotus Notes Archive according to the size then just check the "Split by Size" option & define the constraint size so that multiple chunks of file are created of same size. If the NSF File needs to be split according to folder or year then select the respective option. Can I customize the size of output NSF Files? How to break NSF files into smaller chunks? The suitable method to split Lotus Notes Database in order to reduce its size is, using the provided option to "split NSF file by size". By using the same, you will get the multiple chunks of your NSF file of equal size without hampering the original NSF file as the software creates new NSF files. What should I do if I want to split NSF File by year? First, select the option "Split by Year". Then please do mention the year in the given boxes & process the result. You can verify the result, whether the NSF file is split by Year or no by opening it on Lotus Notes email platform. What if I like to isolate extract a single folder from Lotus Notes? In this case, you can use SysTools NSF Split software. In addition, go with the option "Split by Folder". You just have to select the NSF file from which you want to extract a separate folder. Then, apply additional filters if you want to and then process the NSF file. It will split and create multiple NSF files for different folders. Like this, you will get a separate folder as an NSF file from your single NSF file. Additionally, if you need to delete the folder from your original NSF file, then open your Lotus Notes & select the folder & right click on it, there appears a "Delete" option, select it & now you find that particular folder is not showing. What if I would like to split encrypted & password protected NSF File? The software runs successfully on password protected NSF files & easily breaks your NSF file. You just need to provide password of your NSF File. Discovering about this application was one of the best things I probably did lately that too by chance. 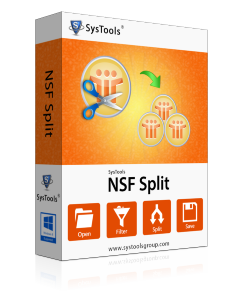 There are plenty of applications in the market undoubtedly yet none worked as good as the Split NSF tool by SysTools. Beginning to work on software and starting with my own database was a little scary at first but the way Split NSF worked, I was comfortable within a couple of moments. It's easy, comfortable to be used, and gives assured results, which makes it great. I would suggest NSF Splitter tool to everyone who are in need of splitting their NSF mailboxes so as to reduce large NSF database file size. It is very cost effective and userfriendly. I tried Split NSF tool to divide my NSF file so that I can reduce the size of my database. It has a simple as well as easy to use GUI. Well done SysTools.